Photographs are travelers of light who wander back to their source in order to capture an ephemeral moment—a volatile and evanescent image. They are relatives of memory, of dreams, of apparitions . . . except they are obedient storytellers who arrest the brevity of an instant and rescue it from a vanishing point. Cuba lends itself to the stillness of photographs, since this isolated island has long existed in a state of paralysis, immobile in time, like a stone raft anchored by the burden of an unrealized dream. Every moment that is embraced by Jeffrey Milstein’s camera seems to be imperishable. His images have a faded beauty reminiscent of old works of art without the craquelure found on the surface of oil paintings. His gaze seems to gravitate to the dilapidation found on the island, to the discolored and fractured walls of elegant and magni?cent buildings that not only narrate thousands of stories but also whisper tales of an unresolved promise—a sort of utopia that never quite materialized. The images contained in this book do more than mirror reality in Cuba. They offer an orientation to its complexities. They present glimpses that are factual, realistic, honest, mixed with a breath of lyricism and quotidian simplicity, capturing our attention and allowing us to see the unseen. They get us in touch with the depth of our own inwardness and expand our sympathies not only for the Cuban people but also for humanity. At ?rst glance, the viewer will be intrigued by the imprint of time captured in the photographs. I was certainly astonished and saddened by the crumbling colonial architecture, by the depiction and mystery of these new ruins. 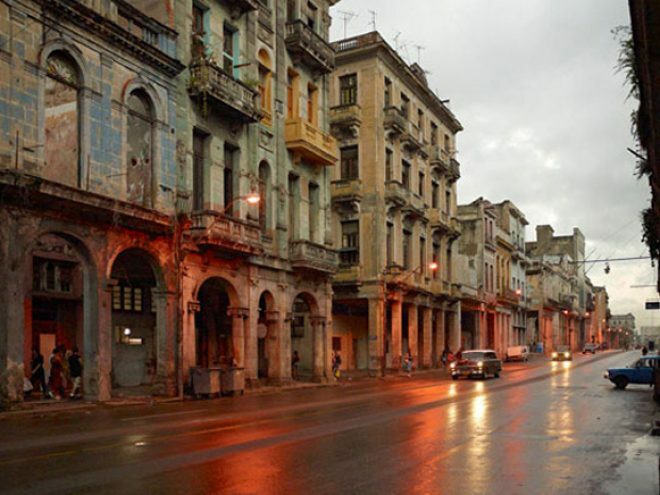 No doubt your own curiosity will be stirred as well by the rundown buildings that are determined to defy neglect even if they can only show the remains of their glory—the pulverized testimony of the grandeur that once graced the streets of Cuba. One wonders if the decaying architecture portrayed in Milstein’s photographs has been punished for having been built in another epoch since this active kind of destruction is characterized by the takeover of militant regimes. The tendency is to banish all that is representative of any past political ideology or pre-existing system. However, the politics of Communist Cuba have never been able to function without the imprint of time—without the allusion to the past and the vestigial capitalistic corruption that existed during Fulgencio Batista’s regime in the 1950s. The revolution has always been invested in what went on before Castro came into power in order to justify its raison d’être. The imminent fear of an American invasion that could turn Cuba into a semi-colony has always been utilized as a threat and as a means to propagate and fortify the Cuban revolution and its ideals. Nilo Cruz is a Pulitzer Prize–winning Cuban-American playwright.